Home Facebook Tips News Social Media HOW TO: Use Facebook New Promote Feature? HOW TO: Use Facebook New Promote Feature? Facebook has just introduced a new feature called Promote. Its a paid facility with which you can promote posts and bump your important news, links, and photos higher in news feed. This feature is very simple and very promising for all the companies who are involved in Social Media Marketing. The payment in this service happens via Facebook credits which you can earn or buy using real money. 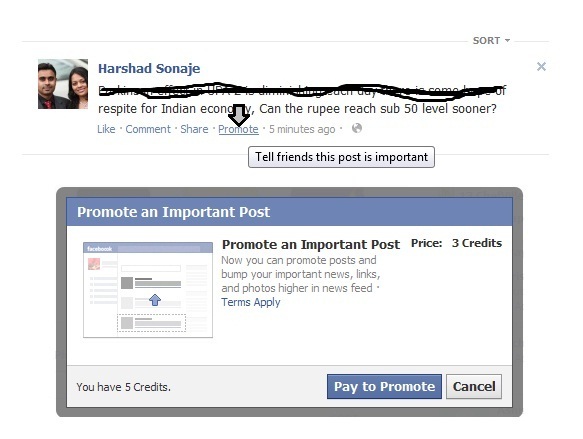 All you have to do is publish a post on Facebook and click on Promote Link near share. The Promoted post will be marked on top of your news feed. This way you do not have to share the same post again and again. Facebook seems to be learning the lessons the hard way but its a good way of increasing revenues for Facebook and good NEWS even for Facebook share holders. People who do not want to avail this service have to make sure they understand the demographics of its fans and plan scheduled posts, but all this also involves cost then why not use this simple feature instead.